The Gib stoppers have finished. The Tawa timber floor upstairs has been sanded and cured with 4 coats of polyurethane, the Tawa floor downstairs has been laid and concrete slab poured under the bridge to raise the carpet level to the correct height. The kitchen was installed on Wed-Thurs and looks great. 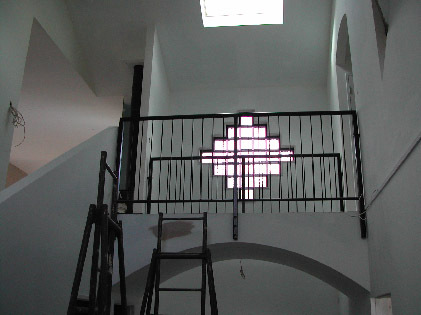 All of the wrought iron banisters have been delivered and installed including the "Romeo balcony" (thank you Beckhams!) outside the master bedroom. The top of the outside of the house has been now been painted. 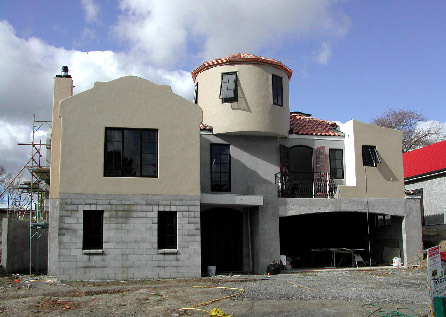 The colour we originally ordered was "Camelcoat" based on another house in Palmy however on our place it looked too peachy. Paul added some black which has made it more of an earthy tone. Just goes to show that you can never be sure of a colour until it's up. All of the internal scaffolding and most of the external scaffolding has now been removed. Steve has started plastering the Dining room and bathroom walls. The electricians have started fitting switches and lights. Most of rooms have now had a sealing undercoat and we are starting to apply some of the final colours in the bedrooms. Tawa floor (covered in dust and cardboard), kitchen (covered in newspaper).